Cocktails & Gelato: Maine Monday: Play Ball! It's hard to believe today is the opening day of baseball season when this is what it looked like around town this morning. I'll bet the Red Sox are very happy they're playing in Baltimore this afternoon instead of at Fenway, their uniforms probably don't fit over snow pants and ski jackets. Boston has a wintery mix today and you can see we're not doing much better a few hours north. Both little C&Gs can't wait for school to be over today so they can watch their World Champion Red Sox take the field at 3:00. Opening day at Fenway is this Friday at 2:00 and I've got to make some room on the DVR (time to erase back episodes of Downton) so they won't miss the big return to the hallowed grounds of Fenway Park. Thank goodness the Portland Sea Dogs still have another ten days before their home opener against the New Britain Rock Cats. 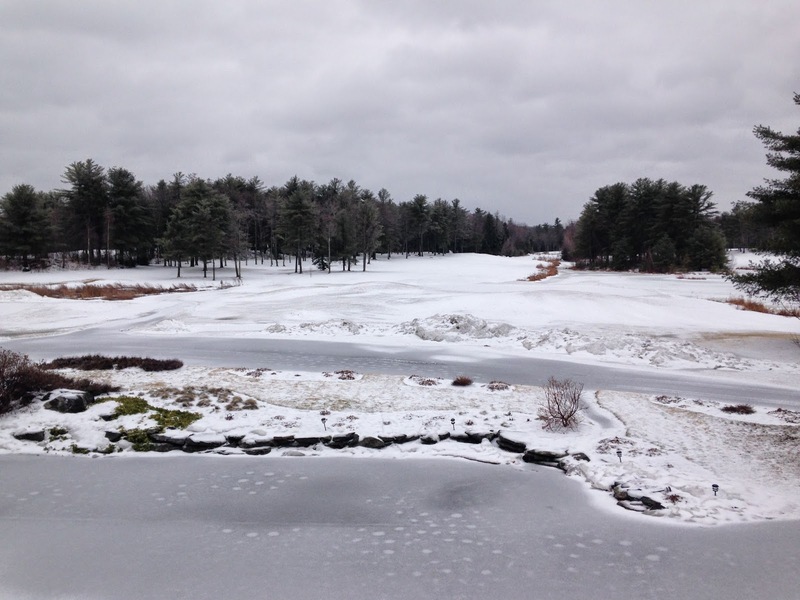 I'm almost positive there will be no snow left on the baseball diamond, but this is Maine and you never know. 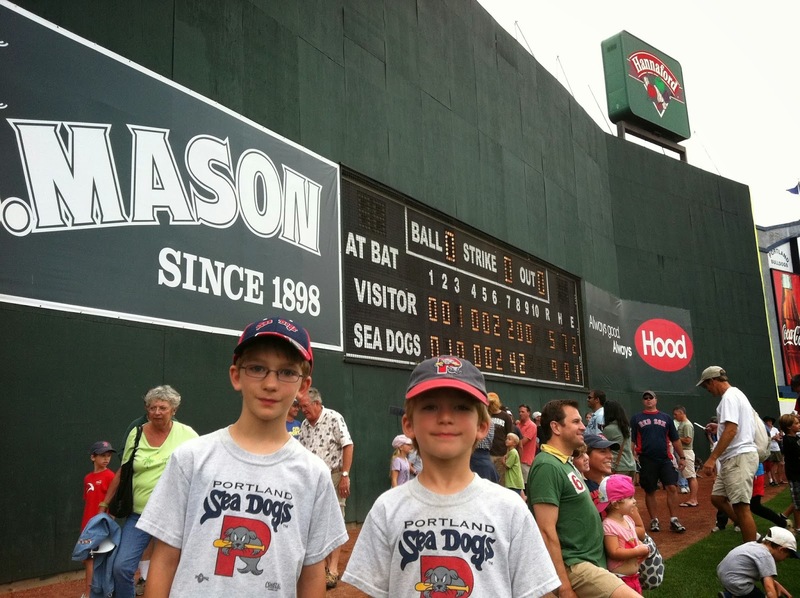 Our Portland Sea Dogs are the farm team for the Boston Red Sox and plenty of big names have run the bases at Hadlock Field. Dustin Pedroia, Jacoby Ellsbury, Felix Dubront, and Kevin Youkilis have all worn the Sea Dogs uniform. Even Big Papi and Dice K have come to Portland as part of their rehab assignment. Which makes for some very exciting minor league games and you never know who will be next to get the call to wear the red jersey. Slugger the Sea Dog mascot keeps the crowds entertained with favorites like the YMCA (how he doesn't fall off the players box I still can't figure out), and kids compete in musical chairs and the hot dog toss for prizes between innings. Young fans (and their parents) get a chance to run the bases after some games (Sunday, April 13th is the first for the 2014 season) and there's always a fun promotion or giveaway going on. Even if you're not a baseball superfan (like the 3 boys in my house) the games are always a good time. Portland has a well deserved microbrew reputation and there are lots of local beer choices at the concessions stand. Shipyard Brewery has its own stand near the 3rd base line with burgers, sausage sandwiches, and other food favorites to go with your Export or Summer Ale. To the right of the entrance is the microbrew stand with Geary's, Sebago, and Boston fave Sam Adams just to name a few. The first home game is Thursday, April 10th at 6:00 (plenty of time to get homework done beforehand) and games go through Labor Day weekend. 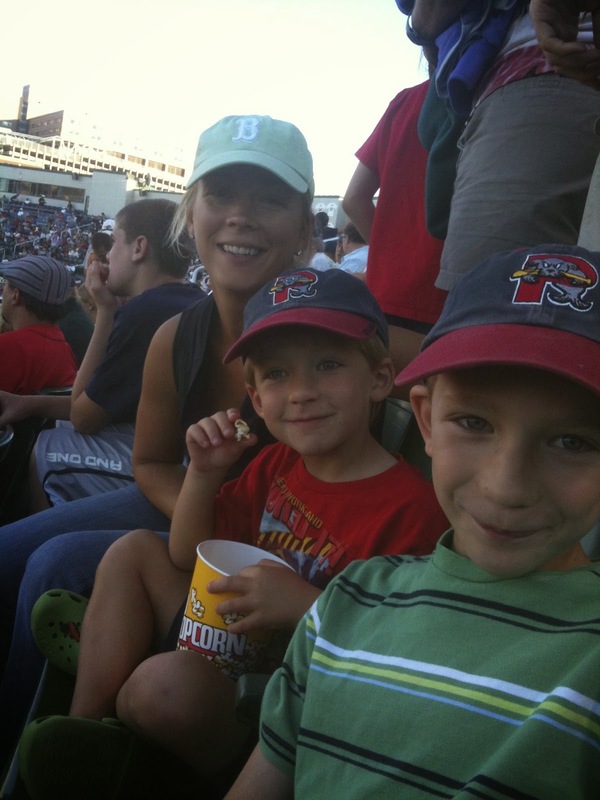 An afternoon or evening game is a great family adventure and tickets are a very family friendly price. Adult general admission is $10 and kids (16 and under) are only $5 (you can't even get a beer at Fenway for that), and that leaves you plenty of money for Sea Dog biscuits. The chocolate chip cookie ice cream sandwiches are the reason why I always jump at the chance to join the baseball loving C&Gs at Hadlock Field.